Last year I made the case for solar stocks. I was reasonably optimistic about the long-term prospects for the industry and thought stock prices looked meaningfully undervalued. 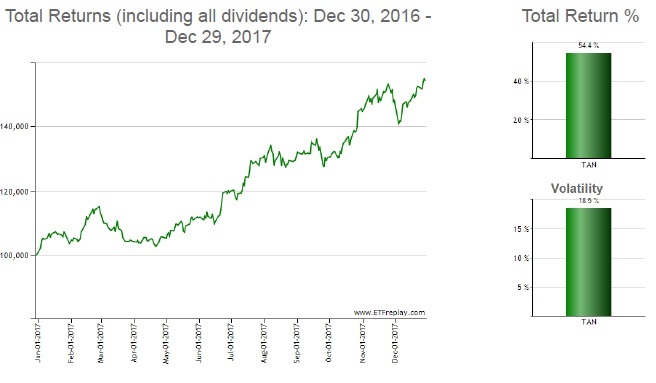 I got lucky timing-wise because solar stocks were up 54% in 2017 — that much I did not expect. Of course, I’m not complaining. But valuations are no longer as attractive, though I’d say still relatively undervalued versus the broad market. And while I still see the secular case for alternative energy, we’ve already scaled back our position. For one thing, it’s a good habit to book profits when you have them. For another, fundamentals of the industry have changed based on the new tariffs imposed by the Trump administration. It doesn’t scrap the case for solar altogether. It’s really a redistribution of gains and losses among companies. But we’re not in the business of picking which individual stocks will win or lose and the tariffs do add a cloud of uncertainty over the industry at large. That could have been welcome news at -70%, but less so at +54%. If you took a position in TAN, you should be up nicely. Indeed, solar was a bright spot last year. But for now, it’s time to dim the lights. This blog is for informational purposes only. Nothing on this blog represents advice of any kind. Investing is inherently risky and involves the risk of potential loss. Disclosure Victor Lai is long TAN.